The Lake Havasu City Military Moms were given a collection of wedding and evening gowns, which we give free to military brides. Corbi Wright is the Program Coordinator. Brides who would like to try on gowns may call Corbi at 928-855-5525 to make an appointment. 1. Either the bride or groom must be from Mohave County to use this program. On April 17, 2012, the Chapter membership voted to extend the program from Lake Havasu City to include Bullhead City, Kingman, Parker, and other towns in Mohave County. 2. We will give the wedding gowns, at no cost, to military brides or veterans or brides who will be marrying military personnel or veterans. Gowns will not be released to brides until one week before the wedding. 3. 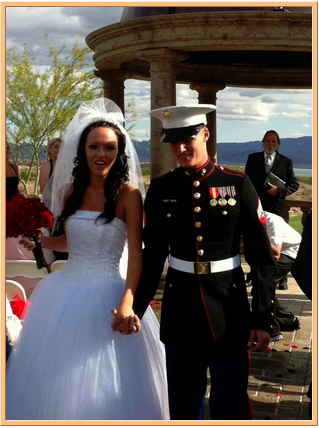 Brides must show military ID or other proof of military service in order to receive a wedding gown. 4. BSM Lisa Mousel makes alterations on gowns. 1. We also have a collection of evening gowns which we will lend to any Lake Havasu City girls (not necessarily military) for proms, balls, or other formal events. Gowns are also available for mothers of brides. 2. Girls under 18 must bring a parent and show school ID or driver’s license. 3. We require a deposit of $25 on evening gowns. Gowns must be returned dry-cleaned, with cleaner’s tag, and the deposit will be returned. Most cleaners in Havasu charge just $10 or $20 to clean gowns. Portside Cleaners and Delux Cleaners both offer discounts to those mentioning the Military Moms. To keep the program going into the future, we accept donations of wedding and evening gowns from the community. Anyone wishing to donate a wedding or evening gown may call Kathy McCraw at 928-486-4901.